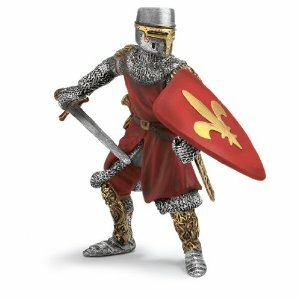 When my oldest son was about ten years old, he liked playing with medeival toy figures. This was nourished by a trip to Scotland which included many castle visits, and the medieval history unit that year at school. He was quite taken with models of knights in stiff-looking armour, men on horseback draped with banners, stocky swordmen with dangerous-looking weapons. Given that they were only a few inches tall they weren’t very threatening. A. never played with them in ways that were terribly macabre, either. Still, I was uncomfortable with the implied violence. About that time, the two of us found ourselves in a toy store, standing in front of a display full of knights and dragons. He was exclaiming over this one with a huge club and that one with a cool flail (the prickly iron ball on a chain). He loved working trebuchet (a giant sling shot sort of thing) and the grim-faced fighters with bows and arrows. “Hey! Here’s one,” I said. 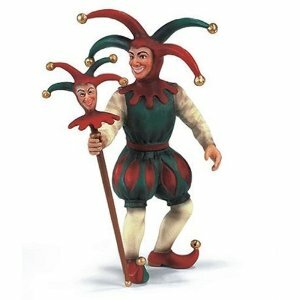 “I like this one the best.” I held up a brightly clad jester, complete with a red and green outfit, and bells dangling from the points of his hat. He was the only character on the shelf who was smiling, even if it was a wild-eyed, half-crazed grin. He sighed, clearly unimpressed with his mother’s preference for non-violence. I didn’t press too far, mind you. I stuck with my no-gun-in-the-house policy and said no to computer games that involved killing, but you have to choose your battles. At least these figures had historical value and no bullets. I thought of those medieval warriors as I worked in my garden this year, stuggling with a snail infestation. The wet spring was just their cup of tea, and they were everywhere. 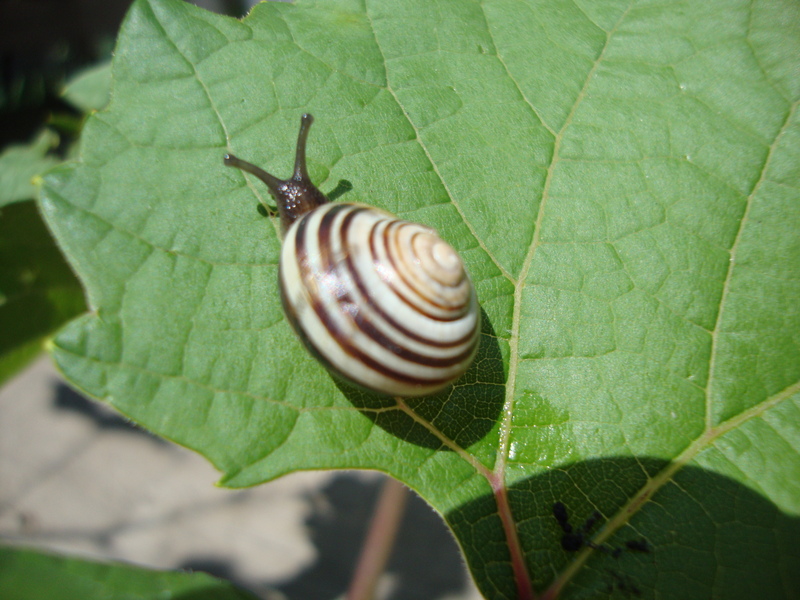 It felt like every leaf I turned over had a snail hiding underneath. I found big, solitary ones out in the middle of the yard as if they had set out on a pilgrimage to a far-off land. I found pockets of tiny, dark-shelled ones underneath the daylilies, a baby snail nursery. I even found a few climbing the tree in our backyard, making their way skyward on what must have been a terribly uncomfortable road. Gardeners don’t like snails. They leave a long, slimy trail behind them as they munch the beautiful green leaves of plants like hosta, lettuce and bok choy. I know you can get rid of them by putting out small dishes of beer (at least they go out happy, I suppose) but I never seemed to remember. So every time I found one (or seven) I would lob them over the fence and onto the road. It was a nice tidy end to them, and one that didn’t involve me doing any of the dirty work. The problem was, I eventually worked farther away from the fence and I was not a good enough shot to get them out onto the asphalt. I tried squishing them under the sole of my boot, which worked fine as long as I was on a hard surface. On the grass, however, that didn’t work, so I tried snipping them in half with my pruners, which turned out to be quite effective. I then discovered that destryong the smaller ones didn’t require that much effort: simply squeezing them between my fingers crushed them easily. It was in the middle of one of these snail murders that I suddenly realized what I was doing. I was not just ridding my garden of a buggy nuisance; I was violently taking the life of these creatures with my own bare hands. The crush of the shell and the slime of their bodies had ceased to be off-putting. Their destruction had become completely normal. I might as well have been armed with a sword and trebuchet. Was this how we came to give our children toy replicas of violent men who killed each other as a matter of employment? Was this how humanity came to world wars and genocides, by simply allowing death to become normal and even blase? By the time I came to this disconcerting revelation, I had all but rid my gardens of the slug infestation. Was that a coincidence? This entry was posted in Uncategorized and tagged backyard, gardening, kids. Bookmark the permalink. My kids wondered why the plastic cowboys crouched down with one arm extended and a trigger finger fondled only the air, the plastic Indians stood with one arm extended, the other hand sqeezing .. feathers?. I explained that they were playing tug of war, you just needed to add a rope. That’s terrific! And I bet they think it’s hilarious now. � Worst of all, the pesticide means the gardener does not need to think or consider the context of the slug problem.